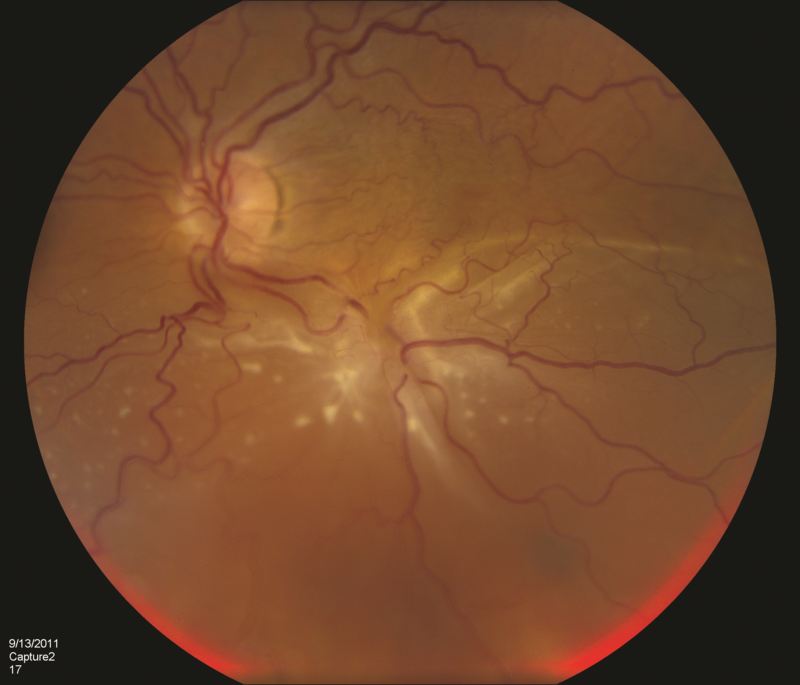 It can be useful to think of the eye as a camera to understand retinal disease. In this analogy, the lens of the camera is the optical media of the eye including the cornea and lens in the front of the eye. The film of the camera is the retina in the back of the eye. Retinal detachments occur at rate of about 5 per 100,000 people per year and over a lifetime, one has about a 1 in 300 chance of developing a retinal detachment. Although this disorder is not uncommon, it is a challenging one for those afflicted, because the retina is brain tissue within the eye and does not remain healthy when detached. For this reason, retinal detachment repair is time sensitive. There are a few types of retinal detachment, including rhegmatogenous, tractional, and serous. The most common type is rhegmatogenous which essentially means that the retinal detachment has resulted from compromise in the retinal tissue which allows subretinal fluid to accumulate. This fluid dissects off the retinal tissue from the wall of the eye. In understanding retinal detachments, it is useful to picture the retina as wallpaper lining the inside of the sphere that is the eye. In rhegmatogenous detachments, most frequently a tear or hole develops in the retinal wallpaper, which then allows fluid from the center cavity in the eye (fluid inside the sphere) to seep through the hole in the retinal wallpaper. This fluid then dissects off the retinal wallpaper from the wall of the eye just as air under wallpaper prevents wallpaper from laying flat. The integrity of the retina relies upon the retina laying flat against the wall of the eye because the retina relies on components in the wall of the eye to stay healthy. One of the greatest struggles in retinal detachment pathophysiology is the developement of scar tissue known as proliferative vitreoretinopathy (PVR) which can pull on the retina and re-detach it even after successful retinal detachment repair. Retina detachment repair techniques in the office include laser, pneumatic retinopexy, and less often cryotherapy. In the simplest terms pneumatic retinopexy involves the injection of gas into the eye to steam roller the retina flat and to use the surface tension of the gas bubble to seal the retinal hole or tear in the hopes that subretinal fluid will resorb and no new fluid will seep in. Once the retina is flatter, laser or cryotherapy are applied with the hopes of tack-welding the retina to the wall behind it in an effort to prevent re-detachment. Retina detachment repair in the operating room includes most often pars plana vitrectomy (PPV) and scleral buckle techniques. Vitrectomy involves the removal of the vitreous gel in the eye using fine instrumentation under micro-surgical technique. The reason for this is that the natural vitreous gel is often responsible for the mechanical traction on the retina that results in tears and subsequent detachment. Sceral buckles are an entirely different technique in which an external band or other material is applied around the eye to push the wall of the eye inward toward the detached retina. Theories behind the use of buckles include reducing vitreous traction on the retina and blocking retinal tears by apposing the wall of the eye to the tear. The most common issues in the care of retinal detachments arise when patients think of retinal detachments as a standard disorder with a simple treatment. Because the retina is a living and dynamic brain tissue in the eye, repair of retinal detachment is not as simple as more mechanical approaches to tissue repair. The retina is sensitive to damage from manipulation and scar tissue forms when the retina detaches, which once seeded can potentially re-detach retina for the rest of the patient’s life. Still, most patients have an 80-90% chance of successful re-attachment of the retina after suffering detachment. It should be understood however, that retinal function may not fully return even after successful anatomic retinal detachment repair.